If you have about $32,000 to spend on a sedan and wanted a little bit of power, you could take the easy route and grab a V6 Honda Accord or Toyota Camry. Or, you could get a 365 horsepower twin-turbo V6 sedan that will fly under the radar, and leave more than a few other cars in the dust if you so choose. In Ford’s sedan lineup the Fusion gets all the love. It is a fine machine indeed. Ford even injected some performance into the Fusion Sport with a 2.7-liter EcoBoost V6 that cranks out 325 horsepower. While it’s not an Audi S4 killer, it does provide a more powerful alternative to some of the mid-size imports. Unfortunately, since the Fusion gets all the attention it’s bigger brother the Taurus sits lonely on the lot waiting for a buyer. However, with huge incentives and dealer discounts in place, you can land the twin-turbo Taurus SHO with more power, more features and more attitude than the Fusion Sport or a V6 version of your average Japanese four-door for about the same money. At about $42,000, the SHO doesn’t seem all that appealing. But with dwindling sedan sales, discounts and incentives are easy to find, often to the tune of $10,000 off sticker or more. That means for a little over $30,000, you can get 365 HP and 350 lb-ft of torque hooked up to an all-wheel-drive to keep the power down. Also included is a slew of creature comforts features such as leather seats, navigation, blind spot monitoring, and a rear camera. The Taurus is a superb highway cruiser which is great if you are the type of driver who logs a lot of miles but also likes so to turn on the power. The car used by many law enforcement agencies across the country, so left lane slowpokes might be more encouraged to move on over when they see your headlights. 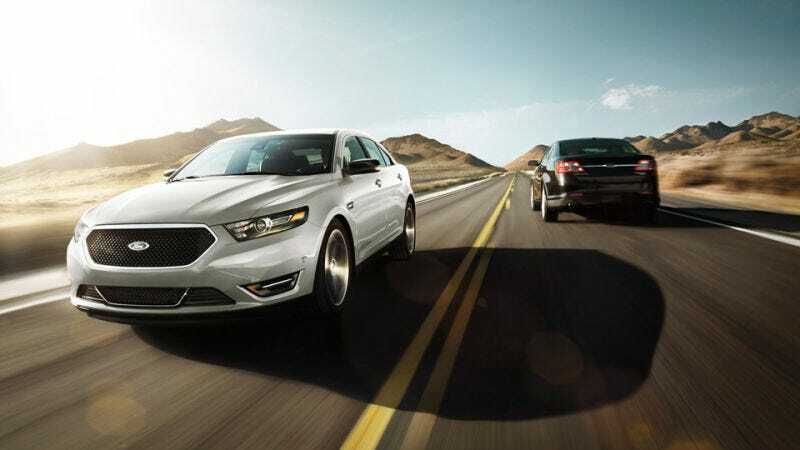 If you are in the market for a brand new fast sedan for about thirty grand, the Taurus SHO is a fast four door bargain you should take for a spin. Who Stuck This Engine In The Perfect Family Car?